We ended our time in Bali back where we started it, in Kuta. Although, this time, we didn’t really do that much. There was a huge storm on our first night which limited what we could do. When the rain started it was manageable – we went out for tea and got rained on but it’s still hot so you dry quite quickly. We (very luckily) had just got back to our room when the proper downpour began which came with thunder and lightning loud enough to wake us up during the night! You would never have known it had rained in the morning though! Plus, we were nearing the end of our budget allocated for Bali – long way still to go after all! So we couldn’t afford to do anything. 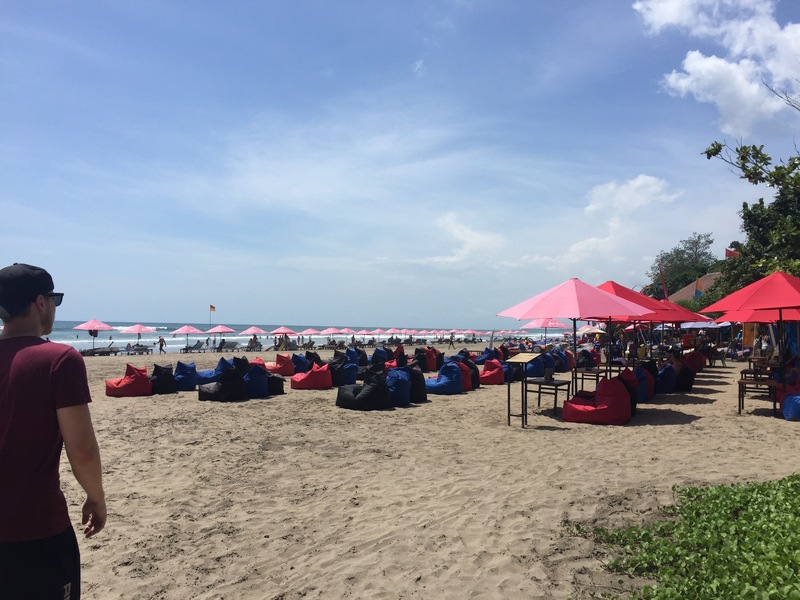 As I’ve already blogged about Kuta and what there is to see (there are also lots of beaches including a huge beach in Seminyak which is a more expensive area! 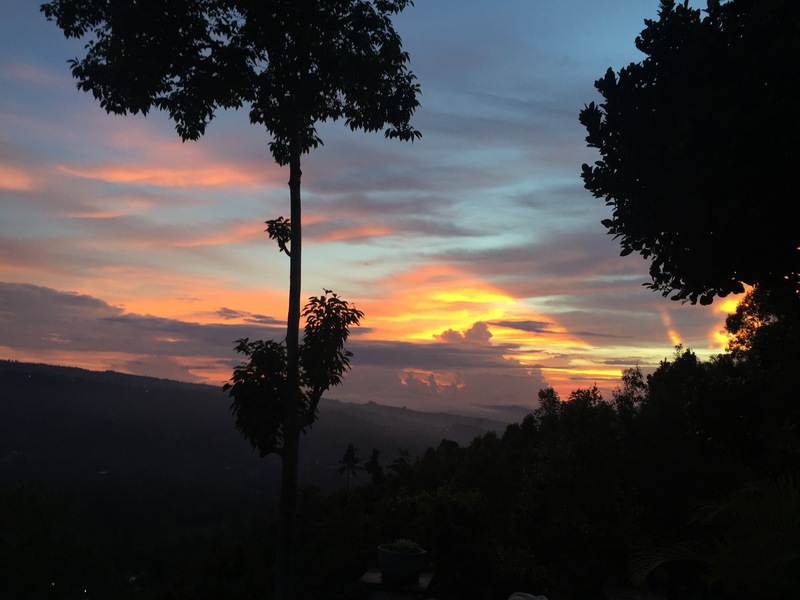 ), I thought I would end our time in Bali reflecting on some of the things we have seen and learnt about Bali, the Balinese and their way of life here. In Munduk, I had used my birthday money to get us both massages. I had to take off my necklace and I put it on the table in the room – this was just a cheap one I bought before I left the UK so it has no sentimental value to me. We had the amazing massages, got dressed and left. It was only the next morning when I woke up that I realised I had forgotten my necklace. Now, they could have easily taken the necklace or thrown it away, there would have been nothing I could have done and they could have said they just couldn’t find it. But, instead, at breakfast, a member of the homestay staff found me and returned it. This was just a small gesture but meant a lot. In Ubud I experienced thoughtfulness from the young boys who helped me climb up the Rice Terrace so that I didn’t get dirty – kind enough in itself – but that wasn’t all. After I bought the postcards from them they made a point of telling me to be careful with my money as it was still sticking out of my bumbag (I was about to put it away). They said this to me until I had my money securely hidden away again. These were such small acts and gestures and are only two of the many kind acts we received from locals to them going out of their way to make sure we found where we’re staying to making sure we have a good time in their country. I will remember their kindest fondly. Another thing that has struck me about my time in Bali is how relaxed the culture is here. Everywhere we have gone you see people relaxing in the shade or happily chatting with friends before sauntering over to take an order at a bar or restaurant – this isn’t laziness, just life. It’s quite refreshing, you stop worrying about how long you’ve sat in a restaurant or if you’re keeping your driver waiting when you have one last look at the view – everything just has its own pace. I read that it takes a lot to phase them and that if something goes wrong you should stay calm because they won’t understand why you have gotten so wound up and so not know how to react – a nice way to approach life! Despite this relaxed atmosphere, the Balinese work exceptionally hard. A man on Gili T who worked at our homestay – the only person we dealt with at all times of day whilst we stayed there – told me he gets 4 days off each month. Drivers will spend 8-10 hours driving you around that day and may have already done other jobs before picking you up and you can see the same workers in restaurants night after night. I am amazed at how they manage it and still give off such a friendly demeanour. Bali is a truly beautiful country and it has a lot to offer any traveller, whether backpacking like myself and Niall or coming for a two week holiday. However, countries such as Australia are able to get cheap flights to Bali and so see it as a holiday destination in the same way we might go to Lanzarote. For that reason, it has been heavily commercialised. Sometimes you will drive down a road and every sign will be in English; all restaurants have menus in only English and some only serve western food; and everything that can be a tourist attraction appears to have a price. Every temple and, sometimes, even the beaches had a price to see them – something I have never experienced to such a degree before. Tourism is the bread and butter of this islands economy and that is very clear. It being a popular holiday destination has (probably) led to it being more expensive as well. Despite what I say about how commercialised it is, it does make it easier to communicate, travel around and see the sights so it is both a blessing and curse. Bali is a very diverse country both in things to do and the landscape. I think it is a brilliant place to travel and has a lot to offer any traveller whether it be to soak up the sun on the beach or immerse yourself in Balinese culture. I feel lucky and privileged to have been able to come here during my time on this side of the world.